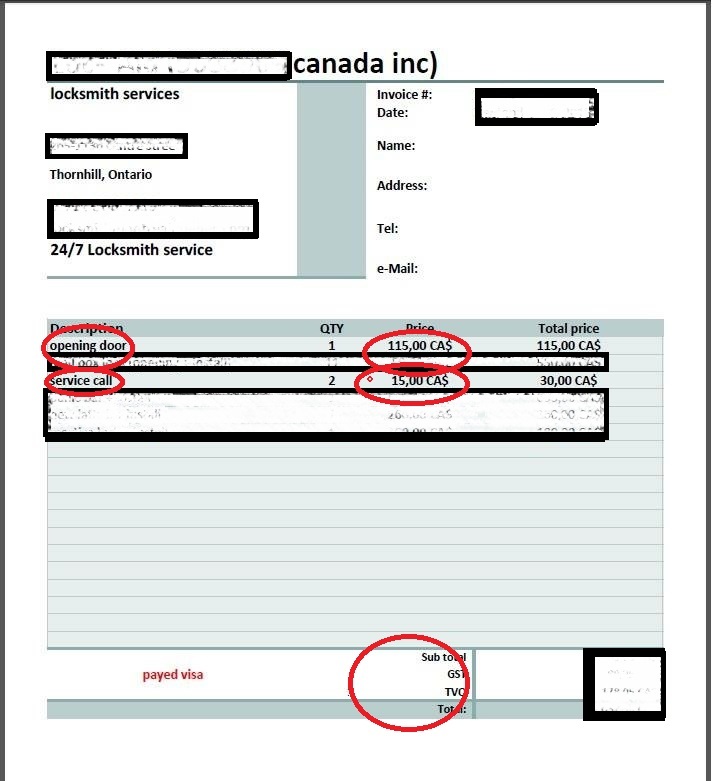 Prices for locksmith in Montreal. One of the most asked queries on Google while searching for Locksmith or locksmith near me is Locksmith prices. Definitely, it is a reasonable wish to know how much the locksmith service will cost you. Especially, if you use locksmith service rarely and try to compare different competitors. Short answer: 35-150$ for service call alone, plus the labor. Here is the expanded version of the answer. Now days, many services (moving, plumbers, electricians, accountants, lawyers, dentists, Bell, Videotron) have changed their approach to the marketing and price strategies. Every single one is offering the initial fee (service call, consultation, estimation etc. )plus the unknown labor. And this strategy proofs to be very effective. 1)Low initial fee could get you the attention of the client and further cooperation. 2)Task complexity. If you hire a locksmith to open the door, and the door has several locks on it or high security lock, the price cannot be the same. 3)There are over 50 lock and architectural hardware producers that are sold and installed in Quebec. Each one of them has a variety of 150 different products, that are then differentiated by size, color, assembly, function, price and application. So, it is virtually impossible to quote the exact price other the phone without actually conducting the proper estimation. The 3rd grade deadbolt lock costs 20$ and 1st grade high security deadbolt goes up to 350$. Some locksmiths charge as little as 15$ for the service call and some, well established once, charge as much as 110$. In both cases, you will pay more. Take a look at the example. If you are not able to establish the price for locksmith service by yourself, we would suggest you start with the reasonable value of that service. Imagine, how much does the car costs if lost all keys? The replacement of all Honda Civic locks will cost you about 1000$. If we take in consideration the broken residential door or window, the cheapest once start at about 350$ plus the installation, plus the new lock. The mediocre condominium or commercial door can easily cost you over a 1000$ plus the new lock, plus the installation.